Once a year this city goes totally nuts. I know enough people who can‘t stand the madness that is the Wiesn, as the Oktoberfest (www.oktoberfest.de) is known here. A Wiese is a meadow, and that’s what the Theresienwiese, as the fairgrounds are called, once were, years ago, when King Ludwig and Queen Therese decided to celebrate their wedding here in 1810. In the first years the Oktoberfest was modeled on the ancient Olympics and was actually a sporting event. Today the only sports involved are raising a liter of beer in a glass mug (that‘s just over three pounds) and keeping your balance while you dance on the table (which is not allowed, but everybody does). Oh, and there’s finger wrestling, or Fingerhakln, of course, and running hurdles to get to the restrooms. So the disciplines aren’t too challenging. I love the Wiesn, which is on for two weeks in late September and early October, drawing over six million visitors. It’s one of the last uninhibited yet strictly ritualized collective excesses without which I firmly believe we cannot be civilized human beings. Since it’s become a phenomenon of mass tourism, a lot of the traditional beauty I remember from when I visited as a young teenager has disappeared, or rather: you have to go looking for it. For instance, the beer wagons are still drawn through town by beautiful horses, the Friesian stallions, decked out in the colors of the respective breweries. Then there‘s a parade by the associations dedicated to traditional clothing, the „Tracht“. Simple lederhosen for men and a relatively revealing dirndl for women are only a small part of that clothing tradition, basically the clothes worn by farm hands and maids. Cheap Wiesn outfits are a dime a dozen and don‘t have the quality of couture or traitional dirndls (the type you see at Loden Frey,), but if you get soaked by a Mass full of beer, honestly, who cares? I can tell you, shopping for a dirndl before the Wiesn is training for the Wiesn itself, as women and girls press into the tightest imaginable changing rooms and hide behind improvised curtains, squeezing in and out of bodices with the help of admiring or critical friends. A well-off business client of mine from northern Germany once tried to buy an expensive dirndl at one of the more refined traditional shops here in Munich that caters to the local VIPs, but the saleswoman switched off her charm and told her that she was simply not well-enough endowed for the look. My client swallowed her pride and asked for it to be fitted, but the saleswoman simply wouldn’t sell it to her. Infuriated, my client left the shop only to find at the next shop down the street that the saleswoman had called ahead to warn them. Incredible, hmm? Yes, that, too, is Munich. But this was years ago, actually, and I haven’t heard any stories like this for a long time. But back to the Wiesn: Every brewery has its own tent, a festive and rather solid structure set up each year. It’s hard to get in after about 3 or 4 in the afternoon, and most people who want to go with friends or business partners or their department at work (and in this town that’s a business appointment) book a table for 12, with a meal and a Mass, about a year in advance. In the evening you do have to deal with a lot of drunk people, but there are plenty of good-natured guards around helping people find their way to the toilets and telling them to get down off the tables. The Wies‘n opens at 10 am, and I generally go around 11, which means I can pretty much forget the rest of the day. When you‘re thoroughly soused (a Mass is all I can handle), only Beckstein, the skandal-ridden, populist Bavarian Minister-President, would recommend driving home. He said he could do it after two Mass, and now he has to take the flack. There are plenty of things to do at the Wiesn to get sober. I wear comfortable shoes so I can go on a spinning top called the Teufelsrad, where a caller runs mock competitions. The ferris wheel gives you the best view of Munich, and there’s an old caroussel called Krinoline that gently rocks you to sleep. 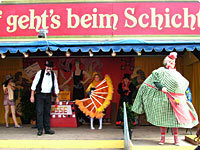 There are still a few old-fashioned illusion shows, including a beheading at Schichtl, which I survived two y ears ago. The flea circus is a marvel. 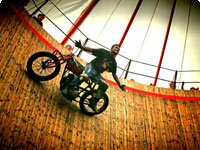 And whenever they are there, I thrill to the daredevil motorcyclists. After we’ve spent all of our pocket money, Helmut and I love to walk home from the Wiesn and to sleep it off. It feels so far away when we wake up that it’s almost like returning from a round-trip to a very exotic place. And it is exotic. It’s Planet Oktoberfest. The Oktoberfest is not Munich (! 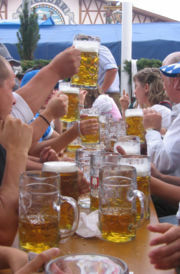 ), and some “Münchner Kindl” – people whose parents were born in Munich – no longer go unless they organize or are invited to a party in one of the rooms that line the main halls of the tents. The locals wear tracht to fairs and on formal occasions and have bespoke wedding dirndls and suits tailored at the old shops, for example at “Tracht und Heimat“, where I recently had my mother’s 100-year old Frankonian dirndl restored. The service, by the way, was fantastic, though they were so incredibly busy that we had to make an appointment to come back later. No problem: The spectacular new synagogue and the Stadtmuseum with its puppet and fairground collection are just around the corner. This is part of the Munich I love. But traditional Munich isn’t the whole story, either. Munich’s in-crowd will party at the Oktoberfest and try to outdo each other with glamorous new looks.